Three weeks ago, some clients wrote a $1.25 million offer on a 1,400 square foot 3-bed, 1-bath house with original kitchen and bath near San Francisco’s Dolores Park. They weren’t even close. There were 51 offers. It sold for $1.4 million and closed 8 days after offers were due. That’s the most offers I’ve seen in 10 years. And a different property at that week got 23 offers. Two weeks ago, another client offered $245,000 over list price on a 3-bed, 2-bath Pacific Heights condo. One of the other 9 offers was the winning bid in this $1.6 million to $1.9 million market segment. That was my client’s fourth rejected offer. He’s looking at two properties in this price range this week, and the listing agents are reporting similar demand: about 10 serious buyers circling. That’s the norm. It’s what some are calling The Facebook Effect on San Francisco real estate. The San Francisco buyer mindset is that they want to get in before they’re priced out, but they either haven’t reaped their firm’s windfall yet or don’t expect much if any windfall from their firm. This mindset dictates a common approach: buy ASAP for the least down. A high-priced market often means jumbo loans above $625,500, which means that the least down is 20%. Jumbo loans are still quite painstaking to get approved and closed. 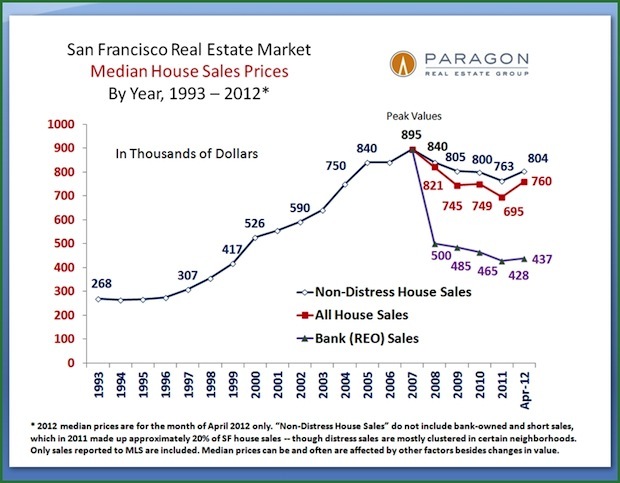 When San Francisco was in a similar (but less intense) frenzy in 2005-2006, it was easy to close jumbos in 15 days. Now it’s 25 days at best (the occasional deal heroics aside). And even though a fast close is a critical factor, price still wins most of the time when sellers receive a stack of offers. Tech valuations are a huge reason for this buyer mindset. It started slow with LinkedIn’s (LNKD) IPO one year ago and picked up steam ahead of Zynga’s (ZNGA) December IPO and through Yelp’s (YELP) March IPO. 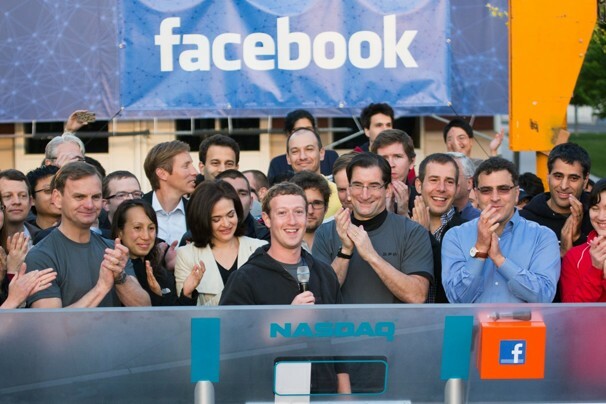 Then as though the Facebook IPO hype machine needed any fuel, they bought another San Francisco company, Instagram, for $1 billion last month. You can argue against these absurdly high valuations all you want but thousands of liquid millionaires are being created before and after these firms go public — and the impact on our property market is real. On top of this you have your tech money machines like Apple (AAPL,Fortune 500), Google, (GOOG, Fortune 500) eBay (EBAY,Fortune 500) and Salesforce (CRM) that provide high incomes for thousands more AND remain a ready takeout option for countless startups all over Silicon Valley and beyond. But let’s be clear: I’m talking about San Francisco, not Silicon Valley. 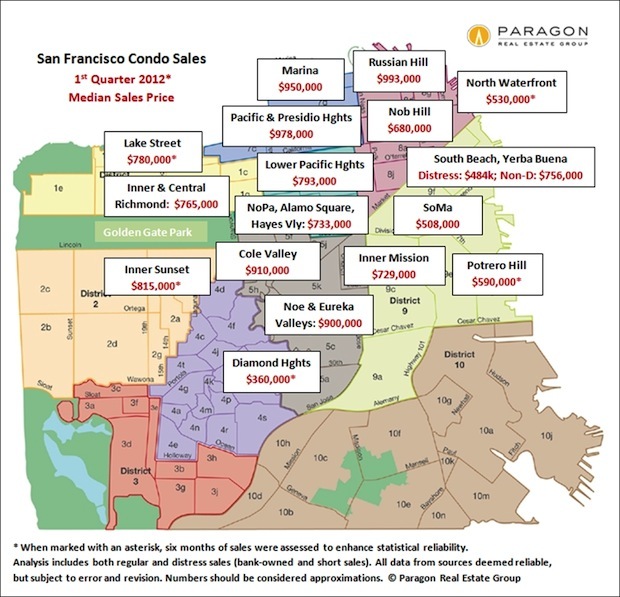 And that leads us to the second huge reason for the San Francisco home buyer rush. With Mayor Ed Lee’s re-election in November 2011, tech firms became more confident about controlling cost structure if they stay in the city. Lee, a 23-year veteran of SF government, was appointed interim mayor January 2011 when Gavin Newsom vacated the slot to begin his post as California’s lieutenant governor. Lee’s top priority at the time was to keep Twitter from leaving. Twitter was looking for space to meet goals to grow from 350 employees back then to 3,000+ in the next few years. The math wasn’t working because San Francisco is the only California city that requires employers to pay a 1.5% tax on gross earnings of all employees (yes, it blows). Obviously payroll tax would be quite prohibitive given all those high paid employees who’d earn even more if/when a multi-billion-dollar IPO came along. So Twitter threatened to split and (this time last year) the city responded by limiting total annual payroll tax on stock compensation of newly public companies to the higher of $750,000 or a firm’s 2010 payroll tax bill. It kept Twitter in the city … with a couple strings: they had to move to a designated redevelopment area so their growth can contribute to revitalizing the rougher mid-Market and Tenderloin areas West of downtown — which they’re doing now by refurbishing the old San Francisco Mart at 1355 Market. And the payroll tax break on stock income runs out in 2017. Not that the policy will even last that long. The city already bent the rule and allowed the tax break for Zynga even though they’re not in the redevelopment zone (they have a lease in the Potrero Hill neighborhood that runs through 2018). Also there’s already talk of replacing tax on payrolls with a tax on gross revenues. But the theme is clear: San Francisco will do what’s necessary to keep tech firms in town. And if the firms stay here to create stability and wealth for thousands here, those thousands spend their money here. 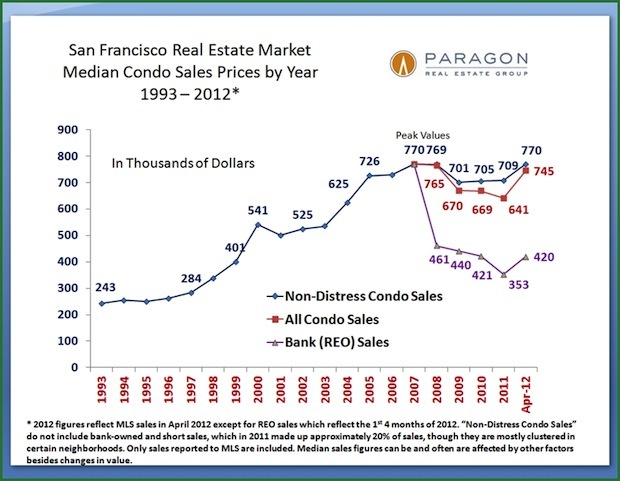 Which of course leads us to third huge reason for the San Francisco real estate fervor. Now we’ve established that hundreds or thousands of people are looking to buy homes that weren’t doing so in the past several years, what’s their available inventory? My friend Patrick Carlisle, chief market analyst at Paragon Real Estate Group, helped me answer this question. Only 5,500 to 6,000 homes sell in San Francisco each year. If you focus down to better neighborhoods, that reduces the number to about third of that range. So when droves of newly wealthy individuals suddenly rush to a low-inventory market at the same time, it can drastically impact the market. Especially in the higher price points above $1.5 million, a segment in which there are only 550-600 sales per year. And yeah sure, sellers are holding back until they see even more buyer froth. So inventory can jump short-term when more sellers finally list their homes. But those numbers I just laid out are still the annual ranges. 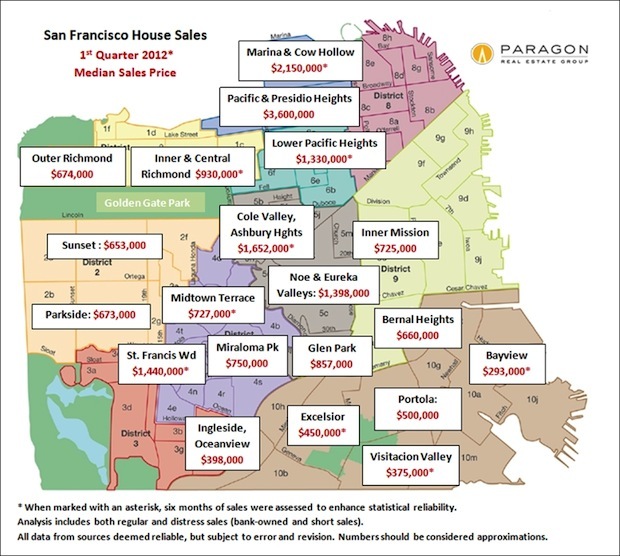 Here’s how San Francisco house and condo pricing breaks down by neighborhood right now. And here are three more detailed charts on pricing. 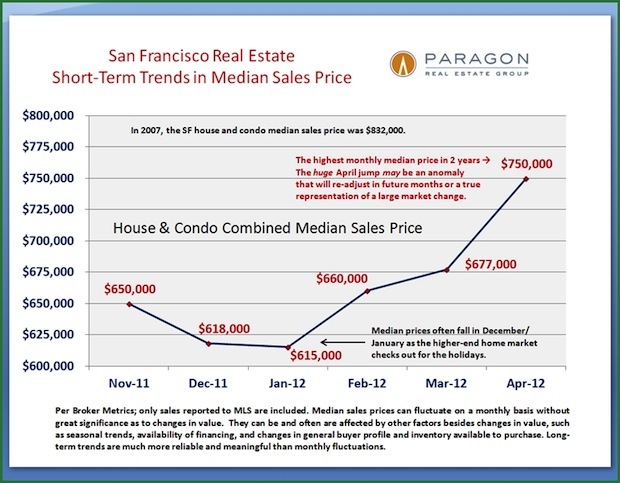 First up is a short-term chart of median house and condo prices that shows a sharp price increase since November. Then the next two provide some longer-term context for house and condo prices across the city. I know this post has gone a bit long, but hopefully it helps you understand what’s going on at ground level in San Francisco. And even then, the data I’ve given is not specific enough for individual decision making. Housing decisions are street to street, house to house. Housing isn’t efficient like other capital markets so you have to price houses one at a time. And I’ve covered how to price a home. You also have to to buy vs. rent math one at a time. But for now the trend (since late-Fall) is still holding where more than half of scenarios I review pencil in favor of buying.